“Electrical engineering professionals have various options when it comes to employment. There are numerous opportunities either as a contractor, consultant, employed either as an electrical installer or maintenance engineer in an industrial setup. Most companies employ electrical or mechanical engineers to head their technical departments. Here, they are required to oversee installation, maintenance and repair of most of the equipment. Throughout my career in the electrical engineering, I have worked in various capacities, in the industry, as an installer and as an independent contractor. All these jobs have their advantages as well as challenges. When professionals follow good practices and standards, most things will work out well as specified by the manufactures and as expected. However, there are instances where some people use short-cuts and do substandard jobs such as using substandard, unreliable parts, loose connections, incorrect wiring, etc. When standards and best practices are followed and of course some common sense, everything works fine. Most successful installations works as expected and that is how it is supposed to be. However, this does not always happen and especially when many people are working on a project or when a contractor sub contracts some of the jobs as has happened on various occasions. There is not much to talk about successful jobs apart from the benefits associated with this. Among the joys of doing things right is that everybody notices and appreciates your work. And apart from the payment that one gets from the job, you build a brand and people will be willing to refer you to others. This is very good for both personal and brand growth. Wait until you do a shoddy job as it has happened on several occasions, and everybody will be complaining about your services, plus you risk getting blacklisted in addition to loosing clients. There are so many careless mistakes and other errors that have caused friction with the clients; some are minor while others are bad and risky. I have had to correct several installation problems, but mainly from work done by other technicians and others due to lack of proper inspections and maintenance. This client moved to a new office but the electrical and network installation guys could not figure out how to install a 10KVA UPS. They connected the servers and some critical machines to the mains and left the client suffering from the unstable power in the area. The office block suffers from frequent power failures, some lasting as long as two or more hours. The client has a 10 KVA UPS and a generator but none was installed in the new office. The UPS is meant to power the servers and a few computers and provide power before the generator picks up. However since it had not been installed, the client was suffering and the server was going off every time there was power outage, affecting everyone in the office and others in remote offices who usually work off the server in real-time. Unfortunately, the other guys had issues installing the generator and even if they had managed, the client prefers using the manual mode instead of automatic mode. The generator is usually powered on manually when power goes off. The reason for this is that they do not want to leave the generator on at night when there is no one in the office. The UPS is therefore very important to them since it supplies the critical loads during the period between the power failure, and the time the generator becomes fully operational. When I was called for the UPS installation, the client wanted the servers, communication equipment, one small multifunction printer, and a number of computers connected to the UPS. The remaining machines had small individual UPSs while a bigger LaserJet printer, a photocopier machine and sockets in the kitchen remained on ac mains. I installed the UPS as per instructions, picking the UPS power from the main panel and then distributing its output to the server room and other specified sockets. After a few weeks, the client had another technician add some extra sockets to the UPS. This was after connecting the generator which wasn’t working before. By this time they now had the utilities, the generator and the UPS. However, they noticed that some of the machine on UPS was going off whenever there was a power outage. They were however functioning as long as the generator or the utilities were on. On investigations, I discovered that the electrician who added the extra sockets had done incorrect wiring. He used the live wire from the UPS but did not connect the neutral to the UPS, instead, the machines were now connected to the Live from the UPS, neutral from mains/generator, and ground was common. After correcting this and ensuring these sockets were fed directly from the UPS, all worked well. 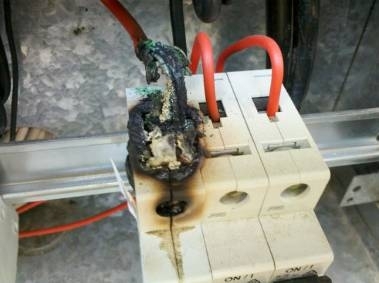 Loose connections are one of the common causes of unstable power, flickering lights, or intermittent power issues within an installation. These are common at the electrical panel, consumer unit, at the meter input, circuit breakers or even at the sockets, and leads to arcing and charring of the connections. This increases the resistance of the connection in addition to heating up the surrounding area. Connecting more loads means more current flowing through the high resistance, hence causing more heating and deterioration of the connections. This may even burn the plastics on which the connections are mounted on, cause fire, or damage the powered equipment. The bad practices and unprofessionalism are dangerous especially when working with high voltages. From experience, it is better to delay a project or spend more money than to rush, use low quality parts and end up with unreliable installations. 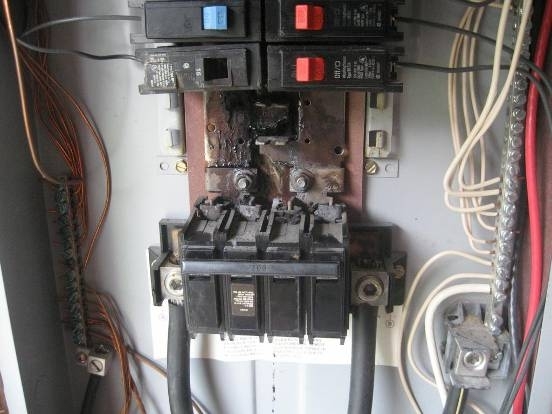 This avoids exposing the consumers to dangers, damaging their equipment as well as expensive maintenance costs. Additionally, it is important to advise consumers to plan for regular inspections so as to avoid expensive repairs or damage to their equipment. Thank you Amos! Any impressions on this testimony? Did you experience the same thing? Let’s discuss in th ecomments section below. or copy this trackback: http://engineering.electrical-equipment.org/others/experiences-in-electrical-power-installations.html/trackback from your own site.